Competitors for the European Commission presidency. Socialist and centre-right European parties have picked each other as prime targets for the EU election campaign, with new TV debates between Martin Schulz and Jean-Claude Juncker scheduled for May. Last week, several German television channels announced two new debates between the candidates for the next European Commission presidency, in the run-up to the EU election on 22-25 May. Martin Schulz, for the socialist PES party, and Jean-Claude Juncker, for the centre-right EPP party, will not only face other top candidates in a number of debates. They will also face each other directly in two-man ‘showdown’ debates. On 8 May, both candidates will stand head to head in Berlin, on the invitation of the Austrian public broadcaster ORF, and German public broadcaster ZDF. On 20 May, the German public broadcaster ARD invited both for a second face-off, just two days before the first polls open in the Netherlands and the UK. For months, the EU election campaign has been largely focused on the predicted surge of eurosceptic parties in the next EU Parliament. But, in recent weeks, socialists and the centre-right have also been in each other’s crosshairs. In his acceptance speech at the European socialists’ election congress in Rome (1 March), Schulz said: “Governments all over Europe have responded to the crisis with pain for people, billions for banks.” This will likely be the strategy for their upcoming campaign: denouncing the austerity-driven policies of generally centre-right EU governments, in response to the economic crisis. Polling data released in recent months has shown that the election will be a close race between the socialists and the centre-right. The winning party will presumably have the right to put forward their lead candidate as next European Commission president. Televised debates could bring energy to the race. But other political parties who put forward candidates for the EU Commission top job have voiced their objections. Earlier, the European Broadcasting Union (EBU) cancelled plans for a showdown between Schulz and Juncker, due to the criticism of these smaller parties. Apart from main contenders Schulz and Juncker, the liberals have put Guy Verhofstadt in the field. The European Left’s campaign is led by Alexis Tsipras. The Greens have two candidates, José Bové and Ska Keller. At the European Parliament session in Strasbourg last week, the extreme-right coalition between Marine Le Pen (French, FN) and Geert Wilders (Dutch, PVV) announced that it wouldn’t nominate a candidate. The Alliance of European Conservatives and Reformists (AECR) announced the same, one week earlier. While face-off debates might draw attention to the race for the top job, polls have also shown that the two main parties could become mutually dependent after the elections. Coalitions between centre- and left-wing parties, or between centre- and right-wing parties, were common practice in the past legislatures, but could fall short of a majority in the next one, leading to a grand-coalition. LSE professor in EU politics, Simon Hix, previously said “we’re going to see a grand coalition, because the centre groups are squeezed together”. Former Italian prime minister and president of the socialist think tank FEPS, Massimo D’Alema, told EURACTIV that “after the elections some deal between socialists and popular parties will be needed. Without such an accord, we’re stuck”. Next May’s European elections are the first to be held under the Lisbon Treaty, which grants the European Parliament the power to vote on the president of the EU executive, the European Commission. Up until December 2009, when the Lisbon Treaty came into force, EU leaders in the European Council selected the Commission president behind closed doors and in a package deal with other EU top jobs. According to Article 17.7 of the TEU, EU leaders now have to “take into account” the results of the EU elections, and nominate their candidate “after appropriate consultations" with the newly elected parliament. Parties have taken things into own hands by nominating their own candidates for the top spot. These ‘single candidates’ will lead a pan-European campaign and, after the elections in May, the largest political force in the new European Parliament is presumed to put their nominee forward to succeed the current commission president, José Manuel Barroso. >> Full background in our LinksDossier on top jobs. 14-17 April: Last plenary session of the 2009-2014 European Parliament. 28 April: (Provisional) date for a presidential debate at the Maastricht University, The Netherlands. 8 May: Debate between PES and EPP, organised in Berlin by ORF and ZDF. 15 May: Date for a presidential debate in the EP in Brussels, organised by the EBU. 20 May: Debate between PES and EPP, organised by ARD. 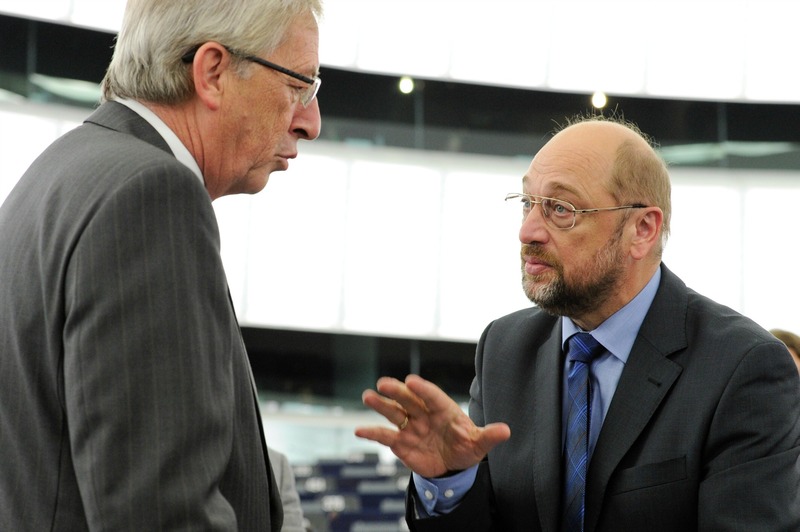 Debates between Schultz and Juncker? I would have thought a burial would offer more entertainment. I find it preposterous and presumptuous that these people think we would be voting for them as individuals given that, in the UK, we are expected to vote for lists. And what manifesto are we voting for when the exclusive right to proposing legislation seems to belong to the Commission? In the longrun, the nations’ leaders will be putting forward their own candidates who, just like the last lost (Van Rompuy, Ashton etc.) will be equally non-entities, who, hopefully, will keep out of the way of the real power-wielders whilst drawing down their expensive salaries and benefits. Here’s a better test – give the position of EP President to whoever can get Putin to withdraw his forces from Crimea/Ukraine. Excellent. We can watch a debate between an arch euro-federalist or a slightly less arch-federalist. Not that you can vote for either of them anyway! One is reminde dof the famous Monty Python sketch whereby one can have a meal of choice, the only proviso being the restaurant offers nothing but variations of Spam. I always preach for an E.U. President ! We have already strip dance roundtable for E.U presidency every six month! Annoying ! Where is our vote ?? That’s why i only vote for real federalists parties ! But the problem was at the 80th . Federalists were always banned from socialists ! So im my opinion whoever, but in forefront of all, Guy Verhofstadt ! We know already what intergovernementalists are heading with austerity and Schultz is one of them ! Would mereley choice Juncker ! If we want an duel the for a real E.U. President from us citizens elected one.